World of Final Fantasy (game, 2016). A role-playing video game by Square Enix, Inc. Developed by Tose, Square Enix Business Division 3. Official Trailer. 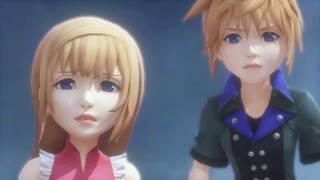 World of Final Fantasy is a role-playing video game by Square Enix, Inc., developed by Square Enix Business Division 3 and Tose. 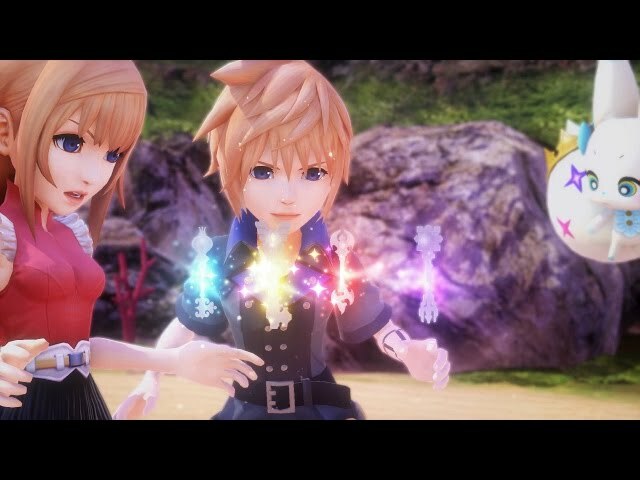 World of Final Fantasy Launch Trailer - Explore the magical world of Grymoire!. In the beginning of World of Final Fantasy, the story begins in a town called Nine Wood Hills, and they travel through a portal to the world of Grymoire. Grymoire is a land where multiple locations from earlier Final Fantasy titles, such as Cornelia (Final Fantasy) and Saronia (Final Fantasy III), fuse together and where multiple climates exist side-by-side. The main inhabitants of Grymoire are the chibi-like Lilikins, while its monsters are called Mirages. The protagonists and others like them are referred to as "Jiants". The main protagonists are twin siblings, Lann and Reynn - Lann is an energetic boy who is prone to act idiotically, while his older sister Reynn is cautious and acts as a foil and counterpart. Both hold a special power in one arm that enables them to control Mirages, the monsters inhabiting Grymoire. They can also switch at will between Lilikin and Jiant forms. The siblings are guided through Grymoire by Tama, a mysterious creature who acts as their navigator and teacher. Their mother is revealed to be a legendary figure called Lusse Farna, who saved the world a century before. Lann and Reynn are guided into Grymoire from Nine Wood Hills by the mysterious Enna Kros, who claims she is God, and aided within Grymoire by Cid, a robot and incarnation of a recurring character within the series. They also encounter a mysterious Masked Woman who offers advice to the siblings but whose loyalties are unknown; and Winged Knight Pelinore, who is related to the fulfillment of the prophecy connected to the siblings. The main enemy is the Bahamutian Army, a force of Jiant-like beings who are casting darkness across the world: they are led by their king Dark Knight Brandelis, and his chief tactician Seguriwades. A character of uncertain allegiance is the Quacho Queen, ruler of a whole race of Penguin-like Mirages living in a temple on the seabed. 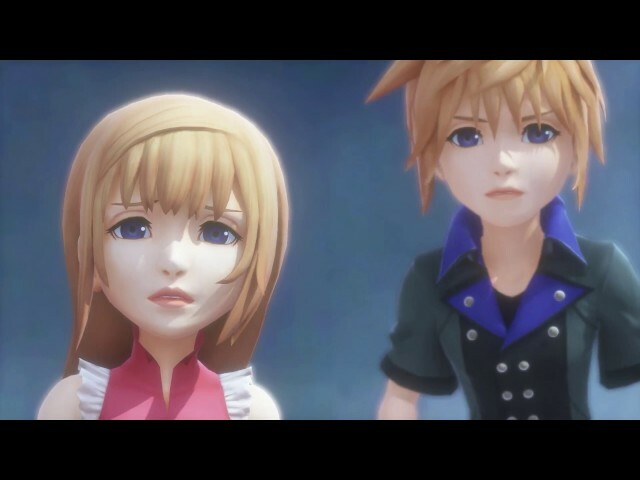 World of Final Fantasy is a role-playing video game in which players take control of twin siblings Lann and Reynn as they navigate the world of Grymoire. In Grymoire, all the characters and monsters encountered by the player are rendered in a chibi-style. The exceptions are Lann and Reynn, who can shift at will between chibi form and their true forms. During their travels, Lann and Reynn befriend various monsters called Mirages that they can utilize both in battle and within the navigable environment: examples of this usage include riding larger Mirages as mounts or using them to navigate environmental puzzles. The game's battle system makes use of the Active Time Battle (ATB) system employed by multiple Final Fantasy games. In battle, players control a party of Mirages which can be stacked upon each other to grant various boons in battle while decreasing the number of turns that can be taken. The types of Mirages used affect the party's available skills and abilities in battle. Mirages are befriended in battle after they have been sufficiently weakened, and once in the party can be freely named. In addition to standard Mirages are special Mirages that can be temporarily summoned into battle using Action Points (AP): the Mirage remains in battle, replacing the main party, until the summoner's AP is depleted. 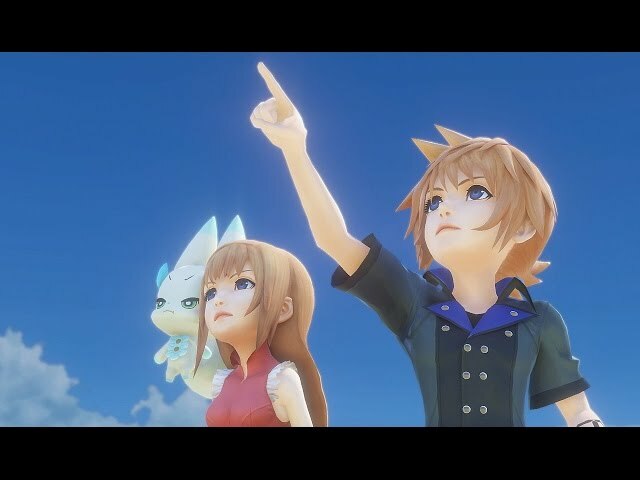 World of Final Fantasy was scheduled to be released by Square Enix, Inc. on October 25, 2016, on October 27, 2016, on October 28, 2016, on November 21, 2017 and on November 6, 2018. The game is made with Orochi 3 engine. This video game is available for the following platforms: PlayStation 4, PlayStation Vita, Microsoft Windows, Nintendo Switch and Xbox One.